At long last, my unit of Morghasts are finished. I spent a little over a year noodling around with these guys, but I think the final result was worth the wait (and the effort). The main change I made to the model was the elimination of the ethereal tendrils on the wings. They were too springy and didn't really match the aesthetic of the skeletal units in the "martial" aspect of my army. The ethereal bits were carefully removed and the wing tips resculpted. To give the models the same stature on the battlefield, I decided to mount them atop shrines from my Skull Forge Scenics range. The bases are what I get asked about most frequently, so here are the progress shots of the basing. The Morghasts' feet required a lot of work to get them to stand on top of the shrines, and each one is pinned in place. The intention is that I can eventually make some desert-themed bases and use the same models in a Tomb Kings army. The weapon hands are removable so I can field them as either Harbingers or Archai. (I still need to paint the swords.) I had also intended to make the helmets removable, but pulling them on and off scrapes the paint on the sides of the face, so I glued them in place. The bald heads don't look that great anyway, and the units are easily distinguishable by the weapons they carry. The models get transported off their bases and weaponless, so the helmets are one less piece that I'll need to fiddle with when assembling the unit before a game. Morghast Archai are heavy hitters– They have fewer attacks (3 each) but are great at getting through armor (-2 rend) and each attack does 3 damage (something the undead units don't have a lot of access to). They are pretty survivable (4+ save that can be increases to 3+ with Mystic Shield), and they have Ebon-wrought Armor that lets them ignore mortal wounds on a 5+. Combined with the Deathless Minions army trait and Ruler of the Night, that gives them two attempts at a 5+ to avoid suffering mortal wounds. 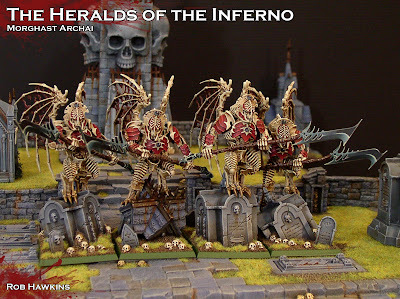 Morghast Harbingers are more of a fast strike unit– They can charge up to 18" and roll 3 dice for their charge range. Harbingers are the load-out you want to use if you are summoning the unit. They can be summoned and set up 9" away from the enemy. An average roll on 3D6 is 10, so they should be able to make the charge. They have more attacks (5 each) but only -1 rend and 2 damage. (Still, nothing to sneeze at.) They lose the Ebon-wrought Armor, so are more susceptible to mortal wounds, but being summoned will allow them to avoid any attacks until they are in combat. Theory-hammer is great, but I'm looking forward to getting these guys on the table and seeing how they hold up in practice. My Hexwraiths have also moved on to the painting stage. I'll leave you with a few shots of the finished sculpting on the riders. The scythe blades have been replaced with the larger scythes from the Zombie kit, and I used the head-tendrils from some spare spirit hosts to build the ghostly trails behind the blades. A couple of the wraiths were either bare-chested, or had armor that I didn't think looked appropriate, so I sculpted robes and hoods on them. I also dropped the brazier-helmets some of them were wearing; flaming heads are my wights' thing! Be honest do you get a little bit giggly when you say"from my range of. . . "? In your Theory-Hammer, it sounds like you have moved to AOS exclusively for your fantasy rules then? No more 8.5? These are amazing! The bases provide a nice change in the poses and give them some more diversity. Lovely work. I years work clearly shows in the result.